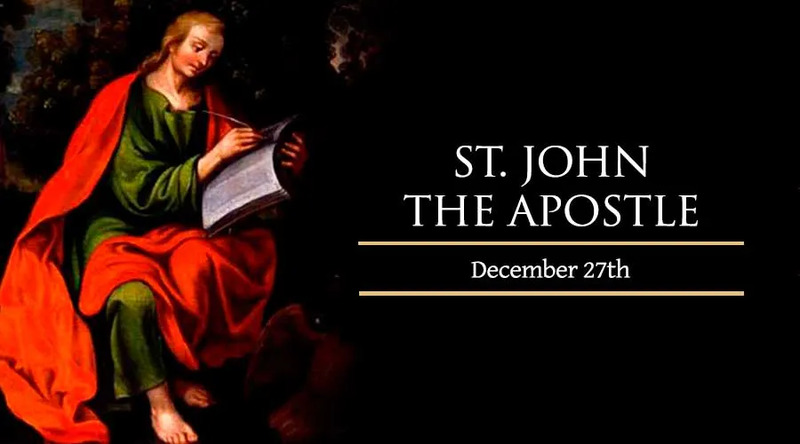 St. John, the son of Zebedee and brother of St. James the Great, was called to be an Apostle by our Lord in the first year of His public ministry. He became the "beloved disciple" and the only one of the Twelve who did not forsake the Savior in the hour of His Passion. He stood faithfully at the cross when Christ made him the guardian of His Mother. His later life was passed chiefly in Jerusalem and at Ephesus. He founded many churches in Asia Minor, and he wrote many important works, including the fourth Gospel, three Epistles, and the Book of Revelation is also attributed to him. Brought to Rome, tradition relates that he was by order of Emperor Dometian cast into a cauldron of boiling oil but came forth unhurt, and was banished to the island of Pathmos for a year. He lived to an extreme old age, surviving all his fellow apostles, and died in Ephesus about the year 100. St. John is called the Apostle of Charity, a virtue he had learned from his Divine Master, and which he constantly inculcated by word and example. The "beloved disciple" died at Ephesus, where a stately church was erected over his tomb. It was afterwards converted into a Mohammedan mosque. John is credited with the authorship of three epistles and one Gospel, although many scholars believe that the final editing of the Gospel was done by others shortly after his death. He is also supposed by many to be the author of the book of Revelation, called the Apocalypse, although this identification is less certain.